For the second year in a row a team from the NCHL is the #1 ranked team in the Central Region. Garnering that honor is Marian University, who sit at a perfect 16-0 on the season. Also ranked is Aurora University at #13. As in weekends past, this weekend has two conference series on tap. #13 Aurora University hosts Marquette University at All Seasons Ice Rinks in Naperville, IL in the first conference series. Each team has been battling consistency over the past few weeks, which has contributed to some lackluster results on the scoreboard. Marquette still has a firm grasp on second place in the conference standings, but for Aurora they have changed into the hunter, having only secured two wins in their first four conference games. Robert Morris University – Maroon hosts Concordia University WI in the second conference series. This will be the seventh weekend in a row that RMU has been in action and the eighth for Concordia. Concordia is still looking to gain their footing in their first year in the NCHL. As they head into the second half of their conference season they look to go into the holiday break with momentum on their side. RMU has been in some tough battles over the past few weekends, which should help them as the season goes along. While Concordia only has one victory on the season, they are not to be overlooked. In non-conference action #1 Marian University travels to Saint Charles, MO to take on #4 Lindenwood University, DePaul University hosts former NCHL member St. Mary’s University of MN, and Northern Michigan University has a home and home with Michigan Tech University. 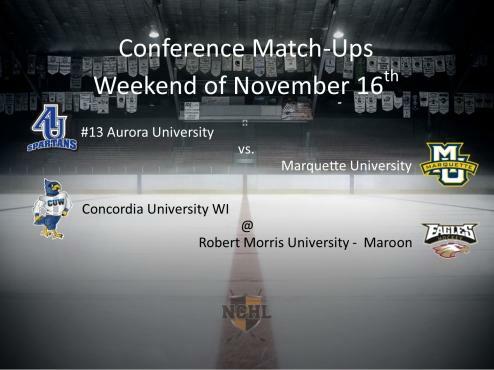 For the first time in three weeks #13 Aurora University will be back on home ice, hosting Marquette University. This matchup will be the fifth straight weekend Aurora has been in action and the fourth for Marquette. Over that stretch Aurora has compiled a 5-4 record, including a SOL to Robert Morris University – Maroon last weekend, while Marquette is 4-2. By virtue of their split last weekend with University of Wisconsin Oshkosh, Marquette moved two points further ahead of idle DePaul University and holds down second place in the conference standings with 14 points. Aurora is in unfamiliar territory this year, looking up the conference standings instead of perched atop everyone else, as they have only secured four points, good for a sixth place tie with Lewis University, during their first two conference series. Last year Marquette and Aurora played two tough games during the regular season, though Aurora came out victorious in each contest. This is a pivotal series for each team; Aurora will be looking to start their march back up the standings and Marquette needs a good series to stay within striking distance of #1 Marian University.